The IBM 2710 Model NP1 is a high speed PostScript, PCL, and PDF printer with upgradable features to include production copying capabilities and is aimed at the large office workgroup, and data center environments where PostScript and PCL are the predominant data streams. 512 MB of memory standard for storing digital images. Standalone Duplicator Solution (#4210). 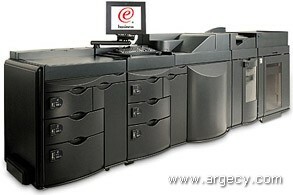 The Standalone Digital Duplicator Solution is intended for reprographics centers and print shop applications. This feature includes all microcode needed for the Standalone Digital Duplicator application. Network Publisher Solution (#4220). The Network Publisher Solution is intended for corporate reprographics centers where an attachment to the corporate network is required. This feature includes all microcode for duplicator printer functions, and also includes the LAN connect capability. Xerox Datastream Solution (feature #4230) - Selected to channel connect your Infoprint 2000 to a host system using Xerox datastreams. This PSO is intended for corporate data center applications and includes a System Control Subsystem (SCS), 512 MB memory, network connectivity, channel connectivity hardware, Xerox Native Datastream (LCDS/Metacode) enablement and all microcode needed for a network printer and data center application. Xerox Datastream Solution - TCP/IP and RJE (1st printer only) (feature #4233) - Selected to connect to a host system via TCP/IP or RJE using Xerox datastreams. Xerox Datastream Solution - Channel, TCP/IP or RJE attach (2nd to 6th printer(feature #4232) - As shown in the table below, this PSO is designed to provide a lower cost solution for printers two through six attached to the same host via channel, TCP/IP or RJE. IPDS Solution PSO (#4250) - This PSO is designed to be used when the host datastream is IPDS. When selecting this PSO, an IPDS attachment feature (#4121, 4131, 4135, 4165, or 4191) must also be selected. The IPDS feature is functionally similar to the IPDS function provided by other Advanced Function Common Control Unit (AFCCU) controllers used on other Infoprint high-speed production printers. These features are available as initial order or MES. A new order for an Infoprint 2000 with the Advanced Function Common Control Unit (#4250) must contain one or two of the following initial order attachment feature codes. If only one is included with the initial order, the second can be added later by using one of the MES feature codes. There can be ONE System/370 and ONE ESCON Channel Attachment. There can be ONE System/370 Channel and ONE Token-Ring, Ethernet (TCP/IP), or FDDI (TCP/IP) attachment. There can be ONE ESCON Channel and ONE Token-Ring (TCP/IP), Ethernet (TCP/IP), or FDDI (TCP/IP) attachment. There can be one Token-Ring, and one ESCON, System/370 Parallel Channel, Ethernet (TCP/IP), or FDDI (TCP/IP) attachment. There can be one Ethernet (TCP/IP) and one ESCON, System/370 Parallel Channel, Token-Ring, or FDDI (TCP/IP) attachment. There can be one FDDI (TCP/IP) and one ESCON, System/370 Parallel Channel, Ethernet (TCP/IP), or Token-Ring attachment. NP1 PSOs: Model NP1 is a complete solution and has no PSOs associated with it. The NP1 and RP1 can have up to three scan stations (one is standard with the RP1). These stations can be selected from a 20 PPM model or a 65 PPM model. Each scan station requires a dedicated Scanner Controller. Paper Supply Module      45.0 inches  33.5 inches  31.0 inches  545 lbs. Printing Engine          64.0 inches  47.0 inches  67.0 inches  1500 lbs. Finisher                 61.5 inches  34.0 inches  22.0 inches  650 lbs. Stacker                  49.5 inches  31.6 inches  33.0 inches  450 lbs. Signature Booklet Maker  58.0 inches  24.0 inches  62.0 inches  970 lbs. Scan Station             10.8 inches  24.0 inches  30.0 inches  74.5 lbs. SCS Cart Assembly        25.0 inches  28.0 inches  12.0 inches  55 lbs. Space requirements for the base printer are 20.5 ft. (6.2 m) by 10 ft. (3.05 m). Space requirements for the maximum configuration (scan station, high capacity stacker, signature booklet maker) are 30 ft. (9.1 m) by 10 ft. (3.05 m). 48 in. (122 cm) from the back of the printer. 42 in. (106.7 cm) from the front of the printer. 36 in. (91.4 cm) from finisher/high capacity stacker/signature booklet maker side of the printer. 30 in. (76.2 cm) from the controller/scan station side of the printer. electrical service with ground AND neutral. All new orders for RP1 must include #9050 or #9051. An English keyboard is the default keyboard for the Operator Control Interface. An English keyboard is the default keyboard for the Scan Station Controller. Intended for reprographics centers and print shop applications. It includes the microcode needed for standalone digital diplicator application. Prerequisites: Infoprint 2000 Model RP1. Maximum Number of Features: One per Infoprint 2000 Model RP1. Corequisites: None. Compatibility Conflicts: Cannot be installed with 4220. Field Installable: No. Initial Order: Yes. Cable Orders: None. Intended for reprographics centers where an attachment to the corporate network is required. It includes the microcode for duplicator printer functions and LAN connectivity. Prerequisites: Infoprint 2000 Model RP1. Maximum Number of Features: One per Infoprint 2000 Model RP1. Corequisites: None. Compatibility Conflicts: Cannot be installed with 4210. Field Installable: No. Initial Order: Yes. Cable Orders: None. Includes Networked Printer Microcode, System Control Subsystem (SCS), 512 MB Memory, Network connectivity, channel connectivity, Xerox Datastream Enablement. Prerequisites: Infoprint 2000 Model DP1. Maximum Number of Features: One per Infoprint 2000 Model DP1. Corequisites: None. Compatibility Conflicts: Cannot be installed with 4232, 4233, 4240, or 4250. Field Installable: No. Initial Order: Yes. Cable Orders: None. Prerequisites: Infoprint 2000 Model DP1. Maximum Number of Features: One per Infoprint 2000 Model DP1. Corequisites: The 4th Infoprint 2000 attached to the same host requires #4110 in addition to this feature. Compatibility Conflicts: Cannot be installed with #4230, 4233 4240, or 4250. Field Installable: No. Initial Order: Yes. Cable Orders: None. Prerequisites: Infoprint 2000 Model DP1 that is the first printer attached by TCP/IP and RJE. Maximum Number of Features: One per Infoprint 2000 Model DP1. Corequisites: Requires one from (#4121, #4131, #4135, #4165, #4191, #5121, #5131, #5135, #5165, or #5191). Compatibility Conflicts: Cannot be installed with #4230, #4232, #4240, or #4250. Field Installable: No. Initial Order: Yes. Cable Orders: None. This feature provides an Advanced Function Common Control Unit (AFCCU) so that the Infoprint 2000 can print AFP/IPDS datastreams. This feature cannot be installed in the field, and is only valid for initial orders. Number of feature required: 0. Maximum number of feature allowed: One per Infoprint 2000. Corequisites: None. Prerequisites: IBM 2710 Model DP1. Compatibility Conflicts: Cannot be installed with #4230, #4232, #4233, or #4240, or with the booklet maker (#4720, #4721). Plant Installation: #4250. Field Installation: Not allowed. Prerequisites: Infoprint 2000 Model DP1. Maximum Number of Features: One per Infoprint 2000 Model DP1. Corequisites: None. Compatibility Conflicts: Cannot be installed with #4230, 4232, 4233, or 4250. Field Installable: No. Initial Order: Yes. Cable Orders: None. The Scan Station includes a scanner and the Infoprint Scan 2000 software. The RP1 comes with one standard Scan Station or Production Scan Station (#5290/5291). The RP1 and NP1 can accomodate up to a total of three stations in any combination of Scan Stations or Production Scan Stations. The Scan Station (#4290/4291) consists of an up to 20 PPM scanner with 300 DPI resolution and a SCSI card. Number of feature required: None. Maximum number of feature allowed: A maximum of two features from the group #4290, 4291, 5290 and 5291 on an RP1. A maximum of three features from the group #4290, 4291, 5290 and 5291 on an NP1. Corequisites: Each Scan Station requires a dedicated Scan Station Controller (#4390/4391 or Customer Supplied) and an Operator Display Station (#4317/4318/4321/4322/4323 or 4324). Prerequisites: Model RP1 or NP1 only, this feature is not available for the DP1. Feature #4287 (Duplicator to Printer/Duplicator SW upgrade) is a prerequisite when installing on a RP1. Feature #4289 (Printer to Printer/Duplicator SW upgrade) is a prerequisite when installing Scan Stations on a NP1. Limitations: None. Plant Installation: #4290. Field Installation: #4291. Holds 8.0 x 10.5 inch to 11 x 17 inch paper. The stacker delivers unstapled documents face down in a first-page- first order. A stacker dolly comes with the stacker to move large jobs easily and without the risk of papers falling. The stacker has two access buttons. The top button partially lowers the tray and allows for the removal of finished sets. The bottom button completely lowers the tray and allows for the use of the dolly to transport a large quantity of finished sets. Number of feature required: One if Signature Book Maker (#4720, 4721) is installed, otherwise zero. Maximum number of feature allowed: One. Corequisites: None. Prerequisites: Model Rp1, DP1 or NP1 Limitations: None. Plant Installation: #4620. Field Installation: #4621. (#4624, #4625) Multiple Stackers Attachment (Initial / MES)This feature provides the capability to attach up to three high-capacity output stackers. Without this feature, each printer can have only one high-capacity output stacker. More stackers reduces or eliminates stopping the printer to empty the output stackers since when one stacker is full, output flows to the next stacker. Maximum number of feature allowed: Two per Infoprint 2000 unless the Bookletmaker (feature number 4720, 4721) is also installed. Only two high-capacity stackers are allowed when the Bookletmaker is also installed, so the maximum number of this feature is one (1) when the Bookletmaker is installed. The Bookletmaker is available on the Model NP1. (#4830 / #4831) Roll Feed Input Attachment (Initial / MES)This feature allows the attachment of a roll feed input device to to the Infoprint 2000. The roll feed device must cut the media to a size acceptable to the Infoprint 2000. The roll feed device must be purchased by the customer from a third party. Saddle fold only (no Z-fold). Folds A3, A4, letter and ledger (11 x 17 inch). Fully integrated into the printer. Number of feature required: None. Maximum number of feature allowed: One. Corequisites: None. Prerequisites: Model RP1, DP1 or NP1. High Capacity Stacker (#4620, 4621) Limitations: Not available with IPDS (#4250). Plant Installation: #4720. Field Installation: #4721. (#5510, #5511) Inserter ModuleThe Inserter Module allows for inserting preprinted items into the jobstream after the fuser station. This protects those items from being damaged by fuser heat. Number of feature required: None. Maximum number of feature allowed: One. Corequisites: RP1, DP1 and NP1 Prerequisites: None. Limitations: Not available with IPDS (#4250). Plant Installation: #5510. Field Installation: #5511. (#4622, #4623) Stacker DollyThis includes an additional dolly used with the stacker to move large print jobs easily without the risk of papers falling. Number of feature required: None. Maximum number of feature allowed: No limit. Corequisites: None. Prerequisites: Model RP1, DP1 or NP1 Limitations: None. Plant Installation: #4622. Field Installation: #4623. Microcode Upgrade Features (#4840) Xerox Datastream Enablement(For IBM US, No Longer Available as of October 16, 2001) (#4841) Xerox Datastream EnablementThe Xerox datastream enablement includes software to convert the Xerox native data stream (LCDS/Metacode) to PostScript level 3. Included with this option is the software and installation. Number of feature required: None. Maximum number of feature allowed: One. Prerequisites: Model RP1, NP1, and DP1 only. When ordering for the DP1, Base Datacenter Publisher PSO (#4240) is a prerequisite to adding #4841. This feature is available on an initial order or MES on the RP1 model. It provides the microcode for an RP1 model with the Standalone Duplicator PSO (feature 4210) to add printer capability. Number of feature required: None. Maximum number of feature allowed: One. Corequisites: Network Connectivity (#4160, 4161) Prerequisites: Standalone Duplicator PSO (#4210) Limitations: Available for RP1 only. Plant Installation: #4287. Field Installation: #4287. This feature can be order on the initial order or as a MES on the NP1 model. It provides the microcode for a NP1 model to be upgraded from a printer only to a Printer/Duplicator. Number of feature required: None. Maximum number of feature allowed: One. Corequisites: Scan Station (#4290, 4291) or Production Scan Station (#5290, 5291) Prerequisites: None. Limitations: Available for NP1 only. Plant Installation: #4289. Field Installation: #4289. Choosing the right supplies is very important with the IBM Infoprint 2000 Printer. For optimum print quality and reliable performance, the use of IBM supplies is recommended. Supplies are purchase-only items. The customer is responsible for ordering and maintaining an adequate stock of supplies. It is recommended that customers maintain a two-to- three month stock of supplies on hand. Material Safety Data Sheets (OSHA Form 20) for Infoprint 2000 supplies with the IBM logo are available in the U.S. by calling 800-IBM-4333. You will need to provide the seven-digit part number or the machine model number and supply type, for example, IBM 4370 Model 002 0r Model 003 Printer. Outside the U.S., contact your local Lexmark Supplier. Yield: 73,000 impressions per bottle of 8 1/2" x 11" impressions at 6% toner coverage. Approximate average yields have been established at a toner coverage of 6%. Application yields may vary with toner coverage, machine settings, paper type and size, and environmental conditions. Applications with extensive bar code or solid area fill can expect to achieve lower than that achieved with average text pages. Warranty for all supplies is one year from the date of purchase as stated on the purchase receipt. Supplies warranties are only for defects in materials and workmanship at the time of shipment and are not for normal wear and tear, nor for any usage minimum. IBM supplies are manufactured to very high quality standards. However, if you believe you are due a warranty return, you should return the supply in its original package or a package from the replacement supply to your point of purchase with an explanation of the problem, a print sample, and the approximate pages run on the supply. DiskettesNone. Trademarks(R), (TM), * Trademark or registered trademark of International Business Machines Corporation.